Let’s start by talking a little about your own musicianship. What instrument do you play and what is your history and career as a musician? Do you play professionally? I started music on piano when I was 4 or 5. I chose flute in 2nd grade in Skokie, IL as my first instrument after piano, but couldn't make any sounds so I switched to violin after 2 flute lessons. I was enrolled in MERIT Music School, which provided music tuition for low-income families in Chicago. They needed a viola for an honors quintet to perform the Schumann Piano Quintet, so I started playing viola then at age 16. Then I auditioned at Interlochen and got into the top High School division orchestra and have just kept playing viola since then. I did my undergrad at Oberlin and Ohio State. I did my 2 year Master’s degree at Rice with James Dunham. I spent my summers at Aspen and completed the 2 year Artist Certificate in Chamber Music at SF Conservatory. I’ve played in orchestras everywhere and I’ve built a network. I make money for playing, yes. I also make money booking gigs with pretty good contracting fees sometimes. That’s about it. I keep my costs low. I have never had a credit card. I just spend what I have. How did the idea of developing Classical Revolution first develop? There are several steps from where we began. My first time playing in a public bar or restaurant was with Kati Wentink when I was 17 in Chicago – we played viola duets at an Italian restaurant. Then at Interlochen Arts Academy they had these coffeehouse sessions where students would perform for each other. These were pretty much private. When I was at Oberlin, people played different kinds of music at the 'Sco. 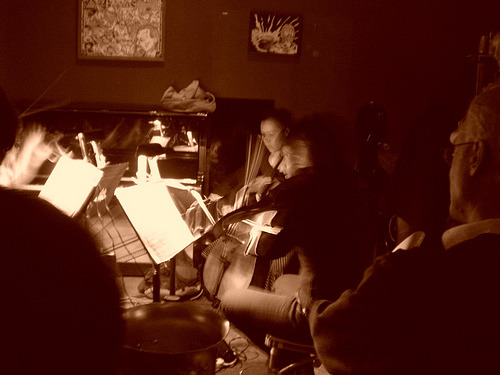 When I was at Rice I heard BarMusic, where Houston Symphony musicians performed contemporary music in a bar. When I was at SFCM, I booked my recital in the bar across the street. When I graduated SFCM I found a cheap place in the Mission District and met some musicians on Craigslist. Ed Baskerville (who went on to found CR in Ann Arbor) arranged a reading through the Mission Arts and Performance Project (MAPP) in June 2006, which brought together SFCM students and SF Symphony musicians for public reading sessions. A couple of months later, I had been hanging out at Revolution Cafe enough for them ask me to do a show there. I called my friends and we played. We had been playing quite a lot in each others’ living rooms as well as in subway stations for tips, so we took it into the cafe setting. We did one show in September, one in October, and then we were offered the weekly spot in November which we still hold 5 years later. What is the mission of Classical Revolution? 1. To get high quality music out in the public so anyone who wants to can enjoy it. 2. To get good musicians paid for playing music. We aim to bring music to more places while creating performing opportunities for musicians that will help them support a sustainable lifestyle as a performing musician. How do most people in bars/ coffee shops seem to react to these classical performances? Some people listen, some people talk. Since we've been at Revolution Cafe weekly for 5 years now, people know the general idea that it’s polite to be quiet or talk in a soft voice. But the fact is that is it a bar and they have live music every night which is generally the kind of music that is customary to talk over. So, there is a balance there that exists between keeping it friendly and open and letting the music have enough space to exist. Sonic space, that is. Ideally the situation works out well for the venue, audience, and musicians. The venue will ask us back to play, the audience will come to listen, and the musicians will return to play. Rev Cafe is not a large venue -- it accommodates maybe 60-70 people, but we pack them in when we're playing. These people can't get this experience anywhere else and they come for their fix. Do you see CR as a vehicle for social change? How so? I do feel that we are broadening the audience for classical music. Many times I have been told, "I never knew how much I liked Mozart!" What we do is really valued in our community. In terms of social change, I believe that we are relevant to bring up in conversations about how arts presentations fit into the changing world. Classical Rev caters to the middle: those who just want to hang out and enjoy music without all the fancy clothes and snobbery. I feel like this is a concept that is not common these days. Everything is becoming polarized. I feel that Classical Rev is here to serve everyone. Rick Robinson in Detroit has been bringing music to homeless shelters, getting his Detroit Symphony colleagues to play for homeless people. We're just getting started; there is a lot more we can and are planning to do! Of the more than 90 venues where I’ve booked Classical Rev in the bay area, most are bars and cafes… but we’ve also played in museums, schools, living rooms, restaurants, backyards, parks, and a couple weird places like a furniture store and sporting goods store. We are basically exploring different possibilities of places to play and people to reach. How do your venues inform your choice of repertoire? For our cafe sessions we mostly read standard repertoire unrehearsed, but our musicians have played the stuff so many times that they can read it well and stylishly and we can all have fun with a performance on the fly. There are no judgments really, so there is freedom to make mistakes and experiment. The motivation becomes less to impress the audience than to communicate with the audience. At Rev Cafe we play a lot of Mozart quartets and quintets, Beethoven, Schubert, Dvorak, and Brahms chamber music. Our group is mostly strings, so the rep is heavy on string chamber music. This past Monday we had an experimental ensemble from Mills College in Oakland and a string quartet from San Francisco Conservatory followed by the reading session. I like to program a featured group like that for the beginning of the set and then keep it open for reading after. We don't predetermine what to play, just who's going to be there, and people are always welcome to come unannounced and sit in to play. It’s very cooperative and friendly. On a slightly different note, what is your personal vision for the future of classical music as a whole? For example, how do you think that the professional concert atmosphere could better accommodate itself to the average person? That’s a good question. Perhaps it can’t accommodate itself to the average person and perhaps it shouldn’t. Perhaps it should remain something for the elite because running an orchestra it is a very expensive enterprise. But, I think there should be more places where classical music can happen that are not so expensive and which are more appealing to the average person. That approach is going after the middle, whereas the traditional orchestra approach is going after the top, the elite. But, they have been catering to the general public by having cheap seats and bringing in pop stars and so forth, but I think in some ways this can alienate the elite and then the orchestras lose funding. It’s a very risky situation that they are in: who do they satisfy and what is sacrificed in the process? More often than not it is the musicians that bear the brunt. Our motto, on the other hand, is: "low overhead, high impact". 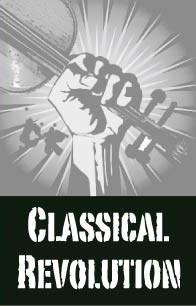 Classical Revolution is holding its first conference during April 27-29, when organizers from the national chapters will come together to meet for the first time, talk, and discuss ways to build up CR. For more information, click here. If you are interested in participating in Classical Revolution, check out their website to see if there’s an official chapter near you. If not, you can search facebook for “classical rev” and there is probably at least an unofficial chapter near you.